Growing up in the desert in Arizona rose hips always sounded so exotic but now that I live in the Pacific Northwest I can find these vitamin C rich tasty fruits everywhere. 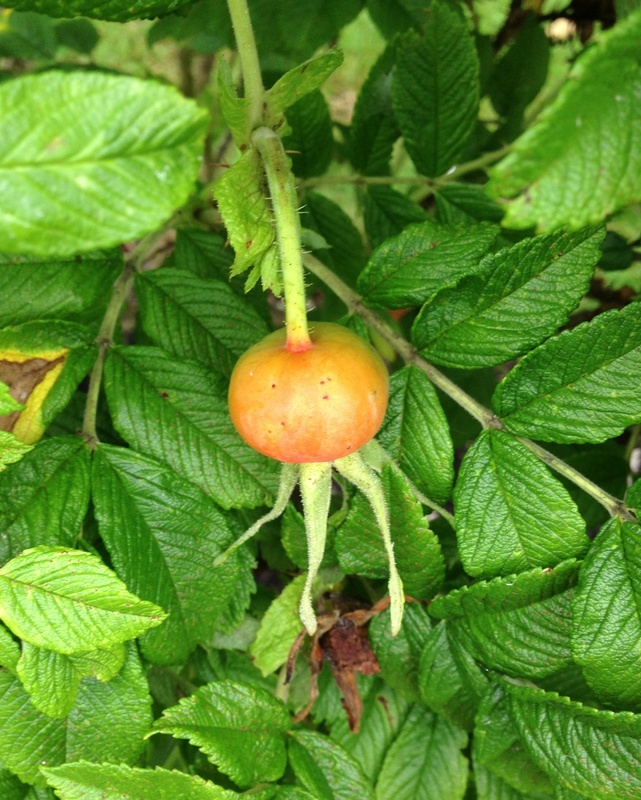 While all bushes make hips, Rosa rugosa is the variety that has the biggest, sweetest fruits. They are ripe now and can be easily harvested. 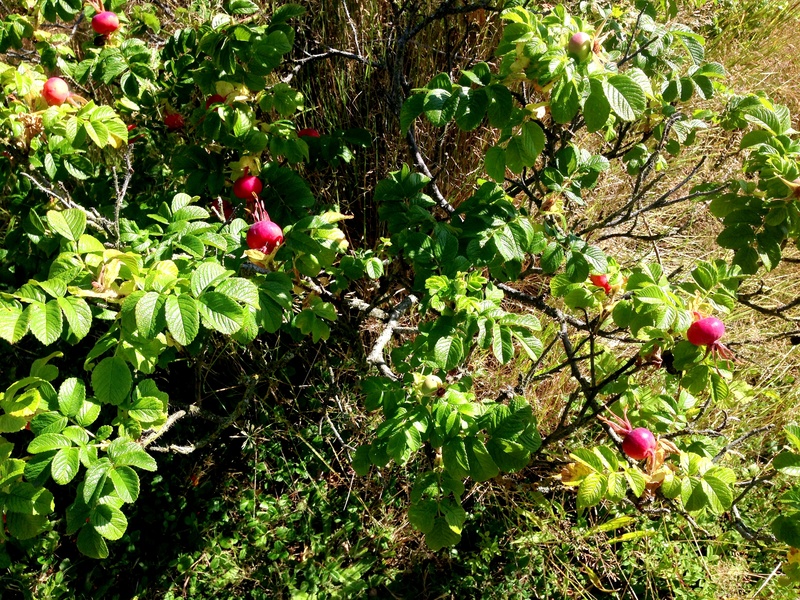 Be careful of thorns and make sure that no chemical sprays have been used. This will be ready to be picked in a few more days. Hips are ripe when soft to the touch. Rose hips contain 25 percent more iron, 20 to 40 percent more Vitamin C (depending upon variety), and 25 times the Vitamin A, and 28 percent more calcium than oranges! Rose hip tea – you can use fresh or dried hips to make this comforting beverage. 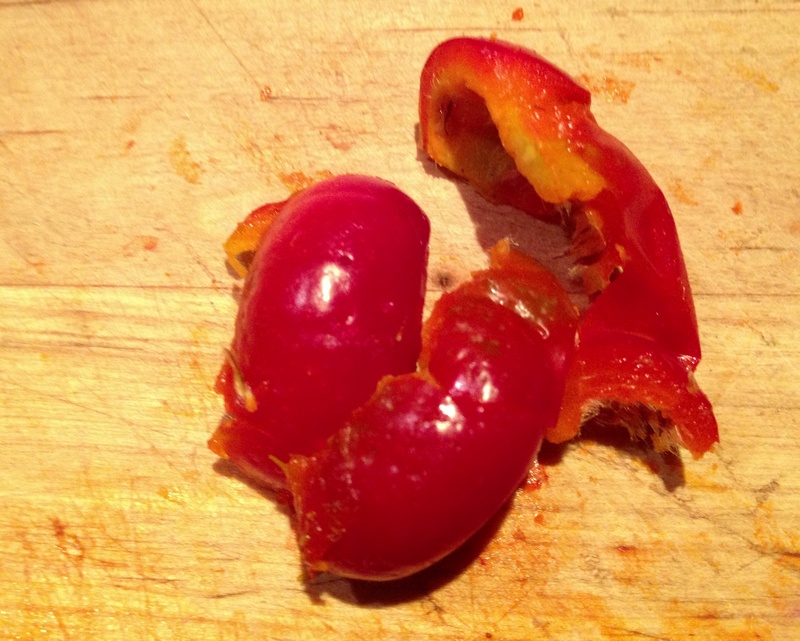 Just soak 3 to 4 hips in boiling water for 10 minutes then add honey or agave syrup to taste. This is great on a cold winter night. 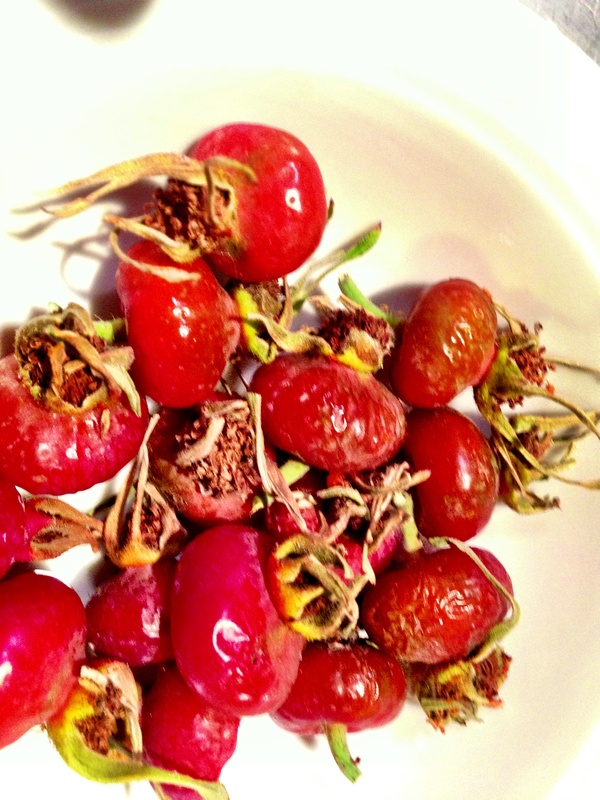 Dried rose hips – split hips, remove seeds and spread in a clean area until dry. Once thoroughly dry put in jars or bags. If not completely dry they will mold. These can be added to recipes or just eaten as is. Seeded and ready to dry. Put the fruit in a jelly bag or line a colander with a couple of layers of cheese cloth and strain out the liquid. To have clear jelly let the juice run out without putting pressure on the bag. This can take several hours. Combine the juice with pectin and lemon juice. Bring to a boil. Add sugar, boil hard for 1 minute. Pour into sterile jars then water bath can for 5 minutes.